Once more, Assad’s killer army and their Iranian and Russian masters are collaborating with the counter-revolutionary ISIS/Daesh so that they weaken the besieged liberation fighters in their last remaining pocket in Idlib. 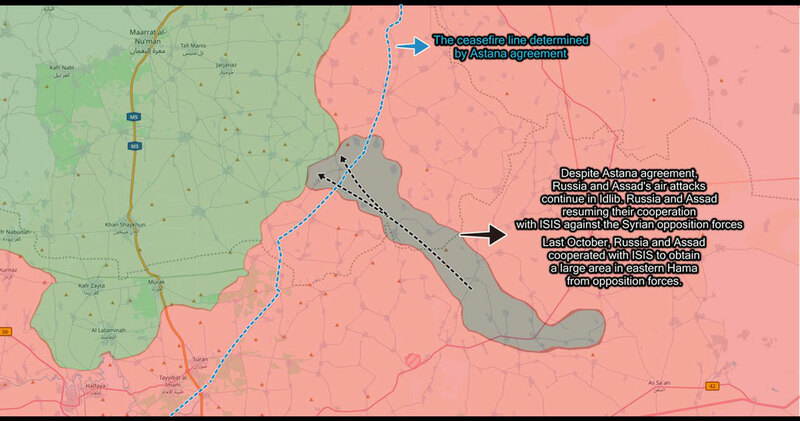 However, as a matter of fact the liberation fighters are in a very difficult situation today given the massive offensive of Assad’s army and the Iranian militias, the daily systematic carpet bombing by Russian warplanes and, now, another attack by Daesh. As a result the latter were able to occupy today the villages Umm Khalakil, Luwaybidah, and Musharifah. This latest assault against the Syrian liberation fighters is another example of the arch-reactionary nature of the Assad regime. The Assad regime is certainly no friend of Daesh. Neither is it a friend of the Kurdish YPG. But both are closer to the Assad regime than the rebel factions which are continuing to fight against the dictatorship and its imperialist masters. The Assad regime has problems with Daesh as well as with the YPG. But the main enemy of Assad, Putin and Rouhani are those forces which are continuing to fight for the overthrow of the tyranny and for the goals of the Syrian Revolution. Against them, Assad is prepared to make dirty deals with everyone! The foolish “left-wing” friends of Assad and Putin are justifying their genocidial war against the Syrian people by claiming that this would be a struggle against the “fanatical jihadists” and “Islamic fundamentalists”. This has always been a stupid lie. Facts speak louder than words: Assad and Putin are collaborating with the “fanatical jihadists” of Daesh against the Syrian Revolution! Hence, we repeat once more our urgent call to all supporters of the just liberation struggle of the Syrian people to double their efforts in order to build international solidarity. The Revolutionary Communist International Tendency will continuing its support for the liberation struggle of the Syrian workers and peasants. When the Revolution is under attack from all sides – the Assad dictatorship, Russian as well as US imperialism, the Turkish and the Iranian regime – it is all the more important to maintain international solidarity with those who don’t give up the struggle. For the RCIT’s analysis of the Arab Revolution in general and the Syrian Revolution in particular, we refer readers to our numerous articles and documents which can be accessed from the Africa and Middle East section of our website: https://www.thecommunists.net/worldwide/africa-and-middle-east/.